Each screen provides sets of questions for you to answer. Questions answered by default will be pre-populated with some details – no time wasted filling in the same data repeatedly. Tap the information icon to get help for any question directly from the relevant manual or help document without opening another app. Add comments or attach notes – including photos or video, with an auto-reminder to caption each file. Case details provides a recap of specific problems you might encounter. Tap to reference an image library of the goods as they should appear, as well as standard operating procedures and manuals. Potential risk or fraud based on prior history appear with suggested corrective actions. More information is there to deepen your understanding – like import applications, receipts and other documents. The app provides a list of experts that are available to help you via call, text or FaceTime. Each visit screen provides sets of questions for you to answer. Questions answered by default will be pre-populated with some details – no time wasted filling in the same data repeatedly. Tap the information icon to get help for any question directly from the relevant manual or help document without opening another app. Add comments or attach notes, including photos or video, with an auto-reminder to caption each file. Instead of pre-populating Field Inspect with a large amount of unwanted inspection types, implementation includes a form builder component. 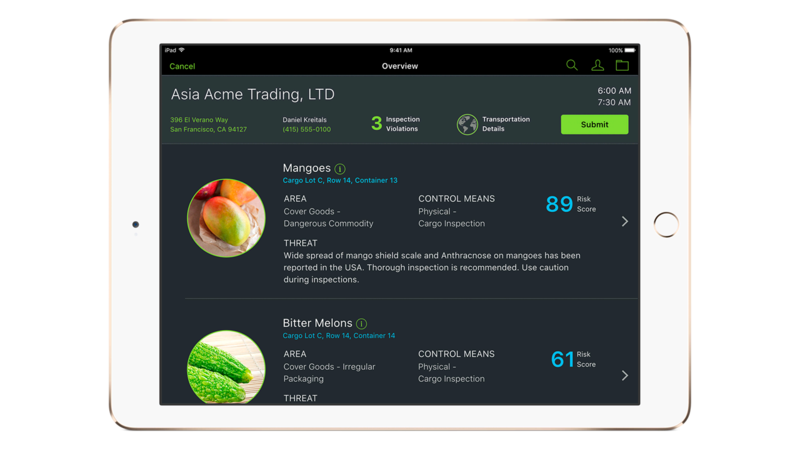 It allows you to edit and manage your own inspection questions. Configure forms to record any necessary information – including text boxes and dropdowns. Add or remove question and forms when needed.